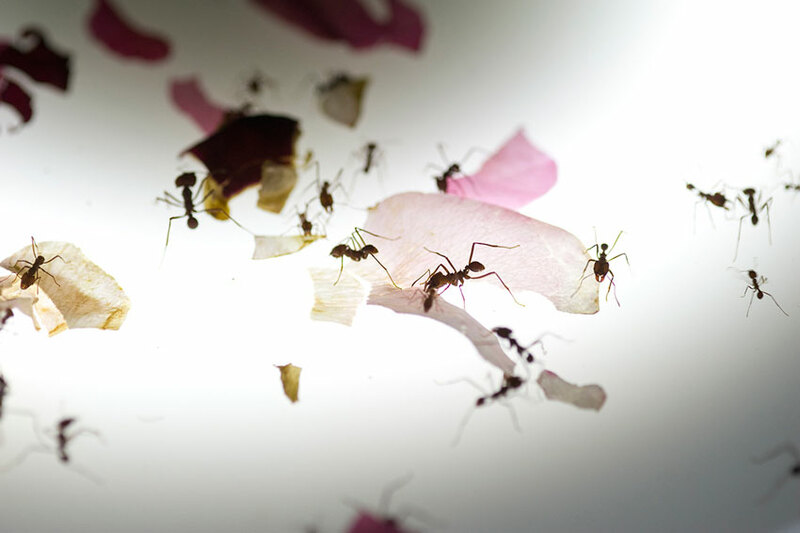 The Tragedy of the Commons consists of a live experiment in the form of an installation, in which thousands of Atta ants – commonly known as leafcutter ants – create a choreography while reacting to certain flavours and smells expertly selected by Robin Meier and Ali Momeni with the help of the Laboratory of Comparative and Experimental Ethology of Paris 13 University. The installation is structured via three circular boards, all connected to one another, if not directly, through video surveillance and sound. The first of these, at the show’s entrance, is occupied by the ant colony and is physically linked to a second and central board through a long transparent tube; the insects move back and forth through this, accessing goods and bringing them to their nest. In this instance, the goods (or ‘commons’) are a mix of privet and rose leaves and petals, discharged daily onto the central ‘platter’. Contact microphones and cameras, set up on its entire surface, amplify the sound of the ants’ stridulation and offer live playback of their gleaning on a couple of monitors, installed – for closer observation – on the third and last board at the back of the room. In other words, Meier (b. 1980) and Momeni (b. 1975) have created a metaphoric ‘food stock market’ for the ants, since every smell or flavour available becomes merchandise capable of affecting their collective behaviour. Accordingly the two artists, who share a background in electronic and experimental music, here manage to make audible and visible a mechanism of social manipulation. On the sonic level, the amplified sound within the installation space corresponds to the ants’ more or less sustained activity – which is particularly effective, grating and loud when, for example, rose petals and leaves are ‘served’ on the central ‘platter’; for, logically enough, the more the ants are fond of a certain flavour, the more greedily they cut that certain plant within their mandibles and, accordingly, the more noise they make. On the visual level, when the central board is overflooded with goods – hence when the insects’ gleaning is drastically intensified – quite stunning traffic jams occur in the tube that the ants use to bring back food to the colony. The transition from the purely biological and ethological experiment to the social and political critical discourse is cleverly or thoughtfully supported by a few hints on paper: namely an atlas and an exchange rate (or currency) book that have been installed with the ‘commons’ on the central board and sprayed all over with natural scents such as orange blossom water. Inevitably the attractive smell of these two manuals leads the voracious ants to tear their pages to pieces. In this installation that evolves with a living colony, then, the symbolic mechanism of the capitalist market – which functions via the creation of demands that largely exceed the vital and primary needs of the population – manifests itself within an aesthetics of saturation, and therein appears the actual ‘tragedy of the commons’.